Looking for Bachelors Grove cemetery? The main parking area is at the Rubio Woods Forest Preserve in Cook County, Illinois, USA. Use the maps provided below for easier navigation. Facing south of the parking lot entrance there are two cell phone towers on the other side of the Midlothian Turnpike. To the west of those towers you will find a vacated road that has become a foot path. The entrance to this path has two wooden pillars with a wire rope across them. If you see a "closed" sign it only means it is closed to vehicle traffic. You will find the cemetery near the end of this path. The cemetery itself is surrounded by a forest preserve and contrary to popular belief it can be lawfully visited from sunrise until sunset. Be cool, don't litter, and enjoy yourself. The original Grove Restoration Project sign that would greet visitors is now in storage at the Tinley Park Historical Society. The area was designated as Everdon Woods in honor of the Everdon family that founded the cemetery. Hopefully some day the Forest Preserve District will officially designate the area as such. Looking to sneak into the cemetery at night? Think again... read up on what happens. Not looking for the cemetery? Try some other locations you may be interested in. 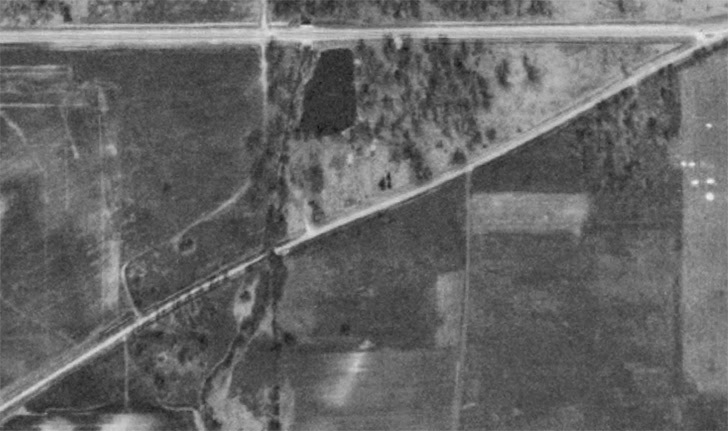 The image below represents what the area used to look like captured via airplane in 1938.